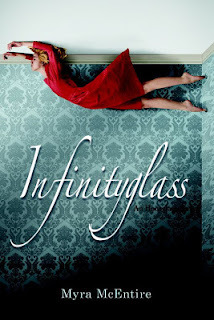 Consumed by Books: Infinityglass Giveaway! Hey everyone! As you all know, the final book in Myra McEntire's Hourglass trilogy was recently released. I've reviewed the first book here, and plan on reading the others in the series soon. Meanwhile, I have a finished copy of Infinityglass for one of you lucky folks to win. If you're interested, here are the details. *One winner will receive a finished copy of Infinityglass and an Infinityglass poster. *Open to the U.S. only. *You have until 11:59 p.m. on September 15th to enter. I love the cover! I've been wanting to read for awhile! I really, really enjoyed Hourglass. I read it in a matter of days (which is fast when your only time to read is a half hour lunch!). I haven't had a chance to read the rest of the series yet though.